Elongated seat with Cleansing Functionality. Two spray wands with adjustable water pressure, temperature, and pulsate functions. Automatic night light function to illuminate the bowl. Anti-microbial materials used in seat and nozzles. Sleek, moulded design lines characterize the Brevia elongated toilet seat, providing less opportunity for debris to collect in the seams, bumpers or hinge attachment. The polypropylene finish, available in a palette of KOHLER colours, will not crack, scratch, stain or peel. This closed-front model includes a cover, plastic hinges and bumper moulding that will not detach. Designed to fit most elongated toilets, this Cachet seat combines subtle styling and innovative technology. Unique Grip-Tight bumpers hold the seat firmly in place and prevent shifting. This soft-close seat features innovative technology that prevents the seat from slamming and simplifies both cleaning and installation. The universal design of this French Curve seat coordinates elegantly with most elongated toilets. This soft-close seat features innovative technology that prevents the lid from slamming and simplifies both cleaning and installation. Grip-Tight bumpers hold the seat firmly in place and prevent loosening and shifting. With a traditional style that complements classic bathroom decor, this Glenbury seat fits most elongated toilets. Made of durable, stain-resistant plastic, the ergonomically contoured seat includes Grip-Tight bumpers that keep the seat from shifting. This soft-close seat features innovative technology that prevents slamming and simplifies both cleaning and installation. C3 125 Electric Bidet Seat For Elongated Toilets In White Experience a new level of cleansing for daily comfort and confidence. This advanced C3 toilet seat with cleansing functionality uses naturally soothing water as a refreshing, hygienic alternative to toilet tissue. Easy-to-use controls let you adjust the water spray for temperature and pulsating motion-all at the touch of a button. Other amenities include a heated seat, adjustable warm-air flow for drying, and built-in odor control. 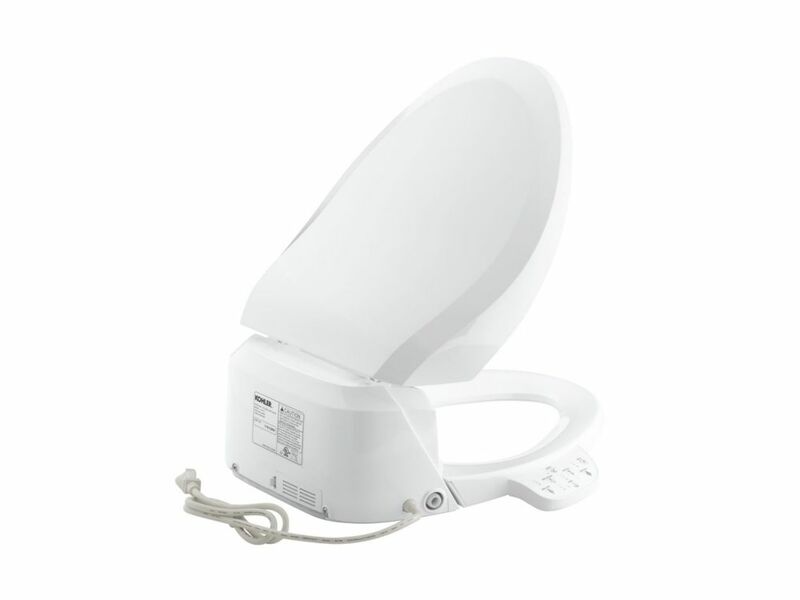 C3 125 Electric Bidet Seat For Elongated Toilets In White is rated 4.8 out of 5 by 22. Rated 5 out of 5 by AL from It did exactly what the manufacturer say it will. The first use was amazing. I am very pleased an... It did exactly what the manufacturer say it will. The first use was amazing. I am very pleased and have already advised my siblings and relatives to get one. Rated 5 out of 5 by Daniel from Works great .... Works great . Rated 5 out of 5 by Alina from Highly recommend this user friendly bidet. We love the heated... Highly recommend this user friendly bidet. We love the heated seat feature. This is easy to clean and quite. Well worth the money! Rated 5 out of 5 by Wanda from Easy to assemble and it is the best thing I... Easy to assemble and it is the best thing I have purchased for a very long time. Love my bidet!! Rated 5 out of 5 by Romeo from Packaging was great... Set up was so easy. Hottest temp... Packaging was great... Set up was so easy. Hottest temp for the seat and water was just right. Night light was a nice bonus. Only thing that could be improved was maybe the air for drying could be stronger but it's ok at its max. Also the pulsating action could probably be stronger also but good. Rated 5 out of 5 by bobrob from works great easy to install. works great easy to install. Rated 4 out of 5 by turtle from I've had this about 6 months. Over all it does the job for the price. Control pad a little hard t... I've had this about 6 months. Over all it does the job for the price. Control pad a little hard to use if your bigger. May consider remote next time, just have concerned of losing it or someone playing a prank on you. Pro: soft close seat and cover, night light, heated seat and temp control , water temp control, front and rear wash, pulse wash is OK, cleaning good. easy to clean sprayer. Cons: seat a little small, because of water tank. Drier takes a while, so don't finish that article before your done, you'll have time while the dryer is on.